Despite Duluth’s northern latitude, our area’s solar potential has been estimated as roughly equal to that of Houston, TX and Jacksonville, FL. In addition, the average cost of solar photovoltaic panels, nationwide, has dropped more than 60% since 2010, making solar energy more affordable and a robust investment for an expanded number of US homes and businesses. Ecolibrium3 has been working with the U.S. Department of Energy’s SunShot Initiative to develop residential rooftop, community, and commercial solar projects in Duluth. As one of SunShot’s 15 Solar Market Pathways program awardees, Ecolibrium3 is focusing on reducing the non-hardware, “soft” costs of solar through community policy and the development of a simpler processes for permitting and interconnection. Together with community partners, Ecolibrium3 is conducting local solar market research and is working with stakeholders to alleviate barriers to installation to help interested residential and commercial customers develop a clear, informed, affordable process to solar energy access. Our goal for this work is to bring the first megawatt of installed solar energy to Duluth by the end of 2017. January 3, 2017 Duluth, MN – After a year of collaboration, design, and testing, the Duluth Shines! 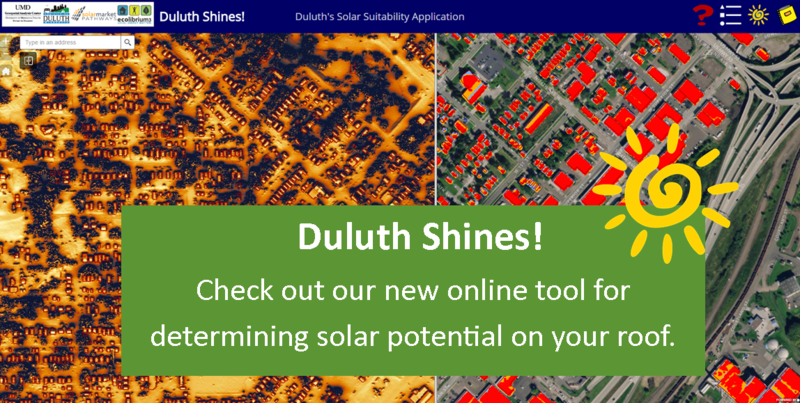 solar application is live and ready for use by Duluth’s citizens curious about the viability of including solar in their home or business energy mix. Using technical assistance funding granted through Ecolibrium3’s and MREA’s Department of Energy Solar Market Pathways awards, in December of 2015 UMD’s Geospatial Analysis Center (GAC) and the Great Plains Institute started work on the Duluth Shines! Solar Potential Map application. This web tool was built using the existing Minnesota Solar Suitability Analysis application, then aggregates and summarizes solar measurements for individual buildings in a more focused and user-friendly format that provides locally calibrated results for installation sizing and cost, and offers information about available incentives, financing and installers. The GAC is currently digitizing a few remaining neighborhoods in the City, and expects the application to cover all buildings in Duluth by February of 2017. This project is just one strategy to help reduce the cost of solar in Duluth. Educating and empowering the public about both general and site-specific solar information better informs Duluthians who are considering solar electric sources for their homes or businesses. It also has the potential to drive down the local cost of solar since finding interested clients is a big cost to solar installers. Additionally, the map can serve as a platform for more detailed and sophisticated planning by the City of Duluth for a variety of infrastructure considerations, including local solar energy projects, as a way to lower energy costs for the City and ultimately, taxpayers. The project is a collaboration between the UMN Energy Transition Lab, the Midwest Renewable Energy Association, UMD Geospatial Analysis Center, the Great Plains Institute, and three Georgetown Energy Prize partners: Ecolibrium3, UMD and the City of Duluth. The imagery used to digitize buildings was shared in a partnership project with the City of Duluth and the State of Minnesota. Funding was provided by the Department of Energy and the University of Minnesota Extension (Regional Sustainable Development Partnership grant).